Today I wanted to let you know about two of my favourite skincare items. My chin area is very spot-prone, which I think is a hormonal thing and I can get those really sore spots that linger under the surface for ages before popping up. I've found two amazing products that I've been using and they really keep the spots away. Honestly, if I stop using them to try something else, the spots come straight back!! I really can't be without these now. Both products are from Sunday Riley but the first, in terms of the order I use them is the Martian Mattifying Melting Water-Gel Toner (£48 at Cult Beauty). This is not your typical toner! It's a green lightweight lotion, that transforms into a thinner liquid on the skin. I use a cotton pad to apply one pump to my entire face and then let it finish soaking in. This makes my skin feel so fresh and clean but it also leaves it moisturised. The finish on the skin is matte but not uncomfortable at all. I also get dehydrated skin so I love that this is good for both spots and hydration. The other superstar product in my routine is the Sunday Riley U.F.O. Ultra-Clarifying Face Oil (£68 at Cult Beauty). This is hands-down the best oil I've ever used. This oil, like the toner, also has a clean, fresh feel on the skin and isn't super heavy and greasy. It sinks in nice and fast. I wear it day and night, it doesn't cause any problems with my makeup. It hydrates the skin beautifully and it really helps to make my skin smooth and clears up any existing spots, whilst preventing future ones. Despite its colour, it doesn't leave your skin green either! I love these products because they are very effective on blemish prone skin without being drying. A lot of spot treatments leave the skin flaky and dehydrated but these do not strip the skin at all. They have relatively high price tags but they are worth every penny for me. They actually last quite a long time too so they aren't something you are going to have to replace every month. I bought these back in October and I've only just started my second bottle of Martian. I've been using them both twice daily for most of the time since October. As you can see, I'll be needing some more UFO soon but I might get another 2-4 weeks out of this! Have you tried any Sunday Riley products? I've got my eyes on the new CEO cream ($65 at Sephora.com) next. It's only been released in America so far though but I think it's due here in a few months. I just wanted to start off this post by saying that I pretty much know nothing about Kylie Jenner and have never watched Keeping up with the Kardashians or anything like that but somehow I'm now obsessed with buying Kylie Cosmetics. I think it's the allure of a hard-to-get-hold-of item that gets me! My second Kylie Cosmetics order was placed because I just had to have the Royal Peach Palette ($45 at Kylie Cosmetics - currently out of stock). This is her first palette with a brush and I'm quite impressed with it. It makes me think of a MAC 217 and it feels nice and soft. I love the overall packaging of the Royal Peach Palette as it is white with rose gold lettering. The choice of colours is really nice and I love the pop of royal blue, it's really unique! I've tested these out and I think the pigmentation is pretty good. You have you go into the product a few times to build up the opacity but I don't have any issues with that. I was impressed with the quality of the matte shades as they are very smooth. I love the inclusion of the metallic purple and green-gold shades and they look really nice when used together. Obviously, the peachy shades are gorgeous too. I think that goes without saying! Do I think the palette is worth the money? Yes, if you're in America but I wouldn't say you should rush to order it internationally when it comes back in stock, unless you want it badly. I will continue to order from Kylie Cosmetics but I just wanted to warn you that it gets expensive shipping things to the UK. For example, if you order something, you need to spend over $60 for the free international shipping. Then, you will get charged £8 admin fee automatically by Royal Mail, plus another 20% of the value of the order on top of that. So for example, if you spend $60, you will need to spend another £18 when your parcel enters the UK before you can have it delivered/pick it up. Hope this post has been helpful and you enjoyed seeing the pretty colours of the Kylie Cosmetics Royal Peach Palette! 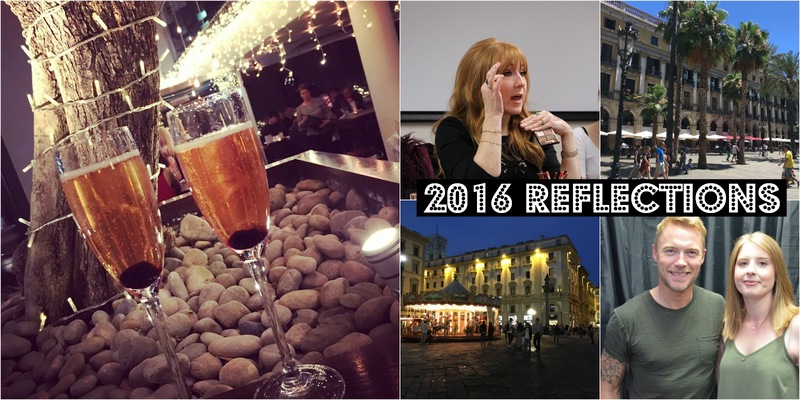 I blogged yesterday about my 2016 Reflections so now I wanted to talk through what I hope to achieve in 2017. Learn to drive and pass my driving test - Following on from my last post, I did attempt this in 2016 but it didn't work out unfortunately but I'm back to try again this year. My intensive driving course and practical test is booked so let's do this! Lose more weight and get fit - I want to focus on eating a lot healthier this year. I managed to get by last year counting calories but if I'm honest, I ate a lot of bad foods, I just got away with it because of portion sizes etc. I've also had way too many colds/flu in the last year so it's time to feed my body the nutrition it deserves. I want to get back in the gym as I haven't been since Christmas Eve and I think I want to focus a lot more on resistance training. Ideally I'm looking to lose around 20lbs or so and get fit! I've teamed up with a like-minded buddy and we've set ourselves a challenge for the next few months so I'm sure that will help boost me towards my target. Be more selective with my shopping - I'm a huge shopaholic and I don't want to stop buying things but I do want to try and be more selective with what I buy. I need to stop buying things on a whim and stick to wishlists to make sure I'm buying something I really want. This will help me achieve some of the other goals that follow. Go to New York - I've been saying for years and years that I want to go to New York. I think this is finally the year to do it. I'm not going to book anything yet but I'm doing my research. Any tips you can offer on hotels, locations, places to go, etc would be extremely useful! Maybe go to London - I've still NEVER been to London! How crazy is that? If I can, I'd like to have a trip to London. I guess this depends on how my saving/shopping is going but I'd love to finally go this year. Any other travel - I'd kind of like a European holiday as well as my trip to New York but I do have some credit card debt to pay off on top of my other goals, so obviously this takes priority but if I could fit in a few holidays this year, it would be perfect. I'd love to try and use more of my money for travel instead of mindless shopping! Start saving towards a car - Hopefully I'll pass my driving test this year and whilst I can share my husband's car, I'd ultimately want my own car! Any savings I can put in this fund will be a bonus and my aim is probably to buy the car in 2018. Blog/YouTube more - As you can see, I've got a lovely new blog header designed by Emmy's Beauty Cave and a new blog template by Pipdig, so I do have the best intentions to blog more regularly this year. Not only do I love talking about beauty and have a lot of stuff I could be writing about, I think it will fill in my time more so that I'm not just going to town every weekend spending money! I started off this year with my first YouTube video in over a year too. It's a Sephora Haul if you fancy watching it. I definitely want to try and film regularly too so any suggestions for videos you would like to see would be fab. Here's to a positive 2017 where we can smash all of our goals and most importantly just be happy! What are you hoping to achieve in 2017? I thought I'd take a little bit of time to reflect on all of the good things that happened in 2016. I suppose this is a bit later than most bloggers' end of year posts but I needed more time to think everything through first. This was also supposed to include my aspirations for 2017 too but the post got pretty wordy by the end of my 2016 thoughts and I had to split it into two posts! 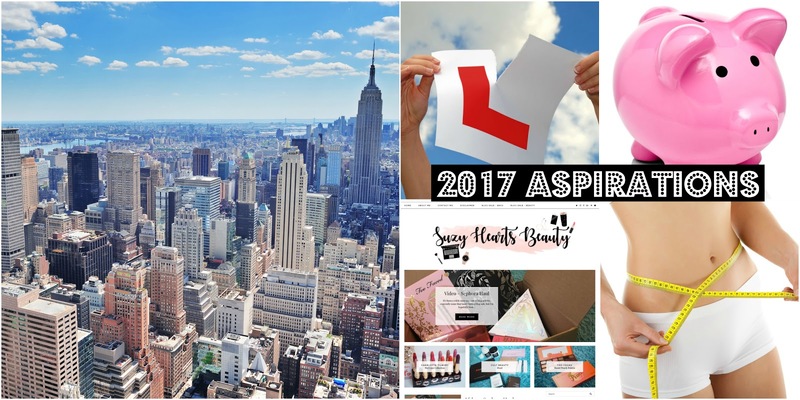 I wrote a 2016 goals blog post last year and I feel like I have worked some way towards those, apart from the cutting down on shopping one. Oops! Attempted to learn to drive - This was one of my main goals for last year. I started lessons with a driving instructor at the end of January 2016, however I quickly realised he wasn't the right instructor for me. He was way too harsh for my sensitive nature, he was constantly barking at me and never encouraging so I started the search for a new instructor after around 6 hours of lessons with him. I found a lovely lady who was exactly what I needed, very nice and encouraging and didn't put pressure on me. BUT. She cancelled lessons all the time, often half an hour before the lesson so I only had 3 or 4 lessons but broken up by weeks without lessons. At one point, my lesson was cancelled 5 times in a row, 1 of which being my choice through illness. This doesn't even take into consideration how incredibly nervous I am at this whole learning to drive thing and it stresses me out so much. The dread of each lesson was making me feel miserable until my lesson was over and because my lessons were on Saturdays, I was dreading every weekend! My new approach for this year was to book an intensive course where I could take a week off work and solely concentrate on learning to drive and hopefully build my confidence, rather than having 1-2 hours a week driving and feeling like I'm starting from scratch every week. I'm under no illusion that this doesn't guarantee I'll actually pass my test first time but at least I should be a long way towards it. Passed my Driving Theory Test - Despite all of the above, I booked in my theory test on the advice of the first instructor and managed to pass first time so I was over the moon with that. This was back at Easter time last year though so need to pass my practical test before that expires! Met Charlotte Tilbury - I was super, super lucky in April 2016 and got invited to spend a few hours with Charlotte Tilbury and some other lovely bloggers to celebrate Charlotte's launch at Fenwick Newcastle. It was a truly amazing experience and I'll never forget it. I've got a blog post here about that fabulous afternoon. Lost weight - I was extremely unhappy with my weight this time last year due to piling on about 25-28lbs within the space of a few months at the end of 2015! I've lost around 14lbs since then without doing anything too extreme. I mainly focused on calorie counting and going to the gym. This was only really in the second half of the year though. Went on two holidays - I went back to one of my favourite cities, Barcelona, in July 2016 and spent my birthday there. I could honestly keep going back as I love it that much! I have a few posts from the first time I visited here. I also went to Florence in September 2016 which tied in with celebrating my first wedding anniversary. It was my first time in Italy and it was such a beautiful city. I really enjoyed this trip. I was thinking I could maybe write some blog posts on these trips, if it's not too late now! Met Ronan Keating - I've been a fan of Ronan for around 19 years or so now. I feel like I get more obsessed the older I get! I'm still a teenager at heart I think! I met him at a book signing about 16 years ago but I was so shy and practically cried. I just got my book signed and I don't even remember speaking to him to be honest! Anyway, this year I ended up paying a fortune to have my first ever front row seats at his concert, along with a meet and greet before the show. This was so worth the money and whilst it was a brief meeting, it was one of the best days of my life! Again, I barely spoke to him apart from saying the words "thank you" about 10 times but to get photos with him and just have his arm round me, it was a dream come true! I know he's famously short but I actually didn't realise he wouldn't be much taller than me so when I was stood just centimetres away, I did enjoy being at eye level with him! Got a promotion at work - I rounded off the year by getting a promotion at work. This is the first time I've ever been promoted in a job so it felt so good to be rewarded for my work and it's made me so much happier with life in general since it happened. I felt like I was worried about what my future was going to hold as I didn't feel like I could go on much longer in my current position the way things were going so I'm glad that weight is off my shoulders now. If I was in the position to blog/YouTube full time, I would totally do that instead though! I know this was a bit of a personal blog post but I hope you enjoyed reading it. Sometimes it's easy to focus on the bad things so I decided it would be good to look at all of the nice things and enjoy what I have done, rather than constantly chasing the next thing or thinking about what you don't have. What made you happy in 2016? It's been a while since any sort of blog activity, especially some that hasn't been a blog sale, but I'm hopefully back now! Hopefully you have noticed my blog header redesign and new blog template too. I'm really happy with the way things are looking now and it's good to start the new year on a positive note. Anyway, the reason for this post is actually to tell you that I've decided to start filming YouTube videos again and I've started off with a Sephora haul. I'm going to try and film something regularly and I'm sure you can imagine there will be a fair few hauls but I'd love to know what else you'd like to see. Maybe take a look at my instagram to see what kind of things you'd like me to feature.